Babies and children up to a height of 1,35 meters (4 foot 5 inches) are required by law to be placed in a child or booster seat in cars. Children (and adults) taller than this are required to use the seat belt provided and may use a booster seat if needed. If you are travelling with a child, it is possible to rent a child seat at BB&L car rental for a small surcharge. Not only will you comply to Dutch and foreign laws, you will also make sure your child travels safely with you. BB&L car rental offers various child seats for children of different ages and sizes ( in combination with your rental car). All available rental cars are suitable for the offered child seats and comply to European ECE rules. The choice for a specific child seat depends on the age and size of your child. The overview below can help you to pick the right seats. The choice between a booster seat with or without backrest also depends on the size of your child. The booster seat with backrest is suitable for children weighing 18 to 36 kilograms (2 stone 11 pounds to 5 stone 9 pounds). The booster seat without backrest can be used for bigger children. If you are unsure which child seat to pick, please contact us for more information. At BB&L car rental, we care for the safety of all our customers. Therefore, child seats can be rented cheaply when renting a car. For rental periods shorter than four days, a 50% discount is offered for all child seats. 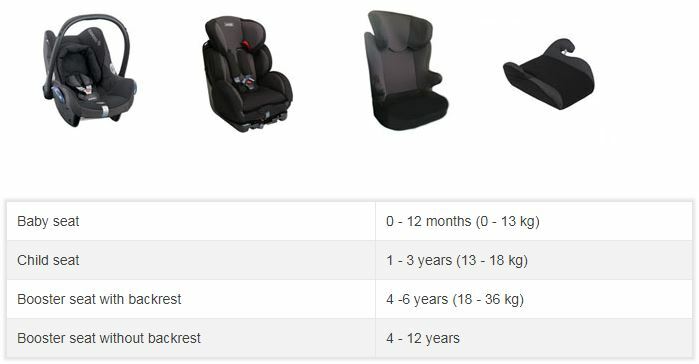 The overview below shows the rental prices for all types of child seats. Prices mentioned apply for a full rental period, regardless of length. For safe use of the child seat, it is vital that the child seats are placed according to the instructions. When renting a car from BB&L car rental it is important that you install the child seat according to the instructions you fiind at the back off the child seat. For your safety, all rental cars available at BB&L car rental are provided with airbags. A child seat place on a passenger seat with front airbag needs to be placed facing the front (toward driving direction). Child seats facing the back can be launched back in case the front airbag deploys, possibly causing serious injury to the child. If you want to place the child seat backwards, please turn off the airbag in the car.